The border post at Evzoni (Greek-Fyrom borders) remains closed from 4:30 p.m. on Monday. Protesting farmers have blocked Idomeni interchange, 200 meters away from the borders with Fyrom.“If police do not prevent the additional forces that we expect to arrive, we will open one direction of Thessaloniki-Evzoni motorway as an act of goodwill,” said the president of the Paonia farmers union Thomas Karypidis to Athens-Macedonian News Agency. 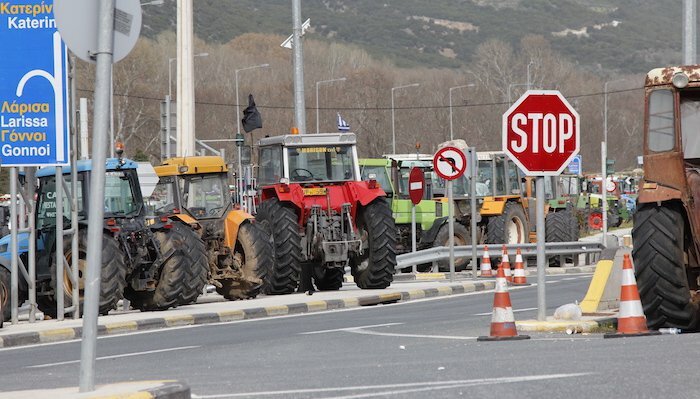 Protesting farmers and livestock breeders departed from the Promahonas customs post on the Greek-Bulgarian border on Tuesday afternoon, after arriving with tractors and other private vehicles early on Tuesday morning. Their tractors are now parked at the Sidirokastro junction outside Lefkonas. They had earlier carried out a protest on foot about 100m from the customs post at 1 p.m., under police supervision.